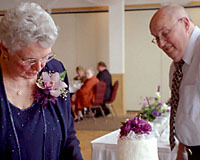 My Dad was my Junior high school principal, my Mom was a "super" sub in our elementary school district (that's them cutting their cake at their 50th wedding anniversary). My sister, several aunts, uncles and cousins are/were teachers, too. So, you might say that teaching is "in my genes?" In fact, I was a Cooperative Extension Agent (an informal adult educator) specializing in landscape horticulture with Cornell Cooperative Extension for five years before starting my consulting business - which includes a variety of educational services (not to mention my radio and television programs, and newspaper column, too). To learn more about these services, click on the links at right.